Available in up to a 2 brick LED system in 5000K Cool White (+/- 500K) or 4100K Neutral White color temperatures propagated with Philips Lumileds LUXEON® Rebel LED’s. Available with 90-300V 50/60 Hz Class II power supply. LED’s rated up to 78,000 (B50 L70) hours for 850 mA operation and 103,000 (B50 L70) for 630 mA operation at 25°C ambient temperature. 480V input option available. Optional 0-10V dimming. Built-in surge protection up to 10 kV. Thermal protection is provided in the form of a dimming thermal foldback until fixture reverts back to the optimal operating temperature. Built-in Active PFC Function >95%/Full load. LED Power Supply conforms to UL1310 Class 2 and UL8750 standards and is IP67 rated for wet locations. 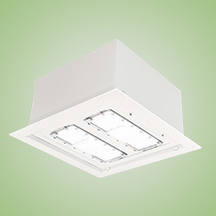 The fixture is recess mounted using the trim ring provided for rough-in.